For security reasons, Microsoft Edge on Windows 10 enforces network isolation. The merits of this, especially when compared to Chrome, Firefox, or even IE, are questionable but beyond the scope of this article. We’re just here to get our localhosts working on Edge for testing! Early builds of Windows 10 had a flag in about:flags section of Edge as shown at the bottom of this article. When Windows 10 Build 10158 was released, a shell command became required to allow it. This command uses the “CheckNetIsolation” tool. Simply run the following command using an elevated (“Run as Administrator”) command prompt. Then restart your browser. 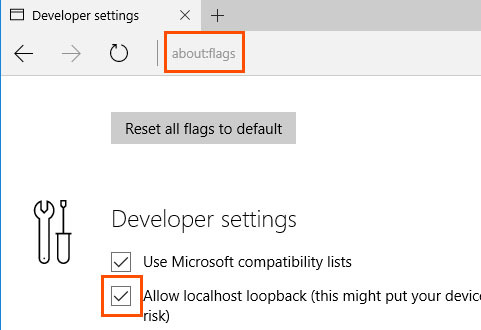 Go to about:flags in the Edge address bar. Check the allow loopback box and restart your browser. Try 1 of these older commands with your administrator command prompt and restart Edge.